Most mysterious places in India will bring your mind, soul, and imagination to life when you will get to know about the amazing stories of these mysterious places. Around 18-20kms to the southwest of the desert town of Jaisalmer in Rajasthan, lies Kuldhara. It is believed that around 200 years ago, Kuldhara was a prosperous village of Paliwal Brahmins. There was an evil diwan of the State of Jaisalmer, Salim Singh, whose eye fell on the daughter of the village head and he desired to marry her forcefully. The Diwan started torturing the people of the village and finally, on one night all the villagers left the village. Before leaving, they put a curse on Kuldhara that no one will ever be able to settle in the village thereafter. To this date, the village remains barren and this place is counted among the mysterious place of India. The village is now maintained as a Heritage site by the Archaeological Survey of India. The mosque and tomb are located in the Archaeological Village complex in Mehrauli and is the tombs of Jamali and Kamali. Jamali was the alias to Shaikh Fazlu’llah or Jalal Khan, a renowned Sufi saint. There’s nothing much known about the Kamali except that he was an associate of Jamali. The construction of the mosque and tomb took around one year to complete (1528-1529). Jamali was buried in the tomb in 1535 after his death. There are various stories about the presence of Jinns (supernatural creatures) within Jamali Kamali. Some of the people reportedly felt someone watching behind the pillars, experienced someone breathing on their neck as also heard laughing sounds. Also read: Bermuda Triangle Mystery Solved? According to the sources, there are over 108 shakti peeths in India. Shaktipeeths are Hindu places where Goddess Durga is worshipped in her different forms. Located in Guwahati on the Nilachal hill, the temple deity Kamakhya Devi is revered as the Bleeding Goddess. Local people believe that the goddess bleeds (menstruates) for three days during the Hindu month Ashaad (June) and one can see the red water of the river close to the temple. The temple also remains closed during those three days. Shettihali church is located 2km from Shettihalli, a small village situated on the banks of the Gorur-Hemavathy reservoir in Karnataka. The Church, built by the French missionaries in the 1860s, is based on the Gothic Architecture. It is believed that the church half-submerges every monsoon and submerges back during the summers. The church was abandoned in around 1960 after the construction of Hemavati Dam and Reservoir. In India, snakes are admired due to their ancient origin, and their connection with Lord Shiva. About 200kms from Maharashtra, there is a village named Shetpal, where cobra snakes have a permanent abode in every house and snakes are worshipped daily. None of the villagers are ever harmed by the cobras and they are welcomed in every house. A special corner for the cobras is built in every house so that cobras can come in and rest there at any time. No incident of a snake bite has ever been reported so far. Also read: Want to experience these haunted places in Delhi? The village of Kodhinhi is just 35kms from Kerala. There are approx. 400 twins in a total population of 2000. The village has one of the highest twin birth rates in the world. This place has become a topic of curiosity and remains a mystery to researchers. 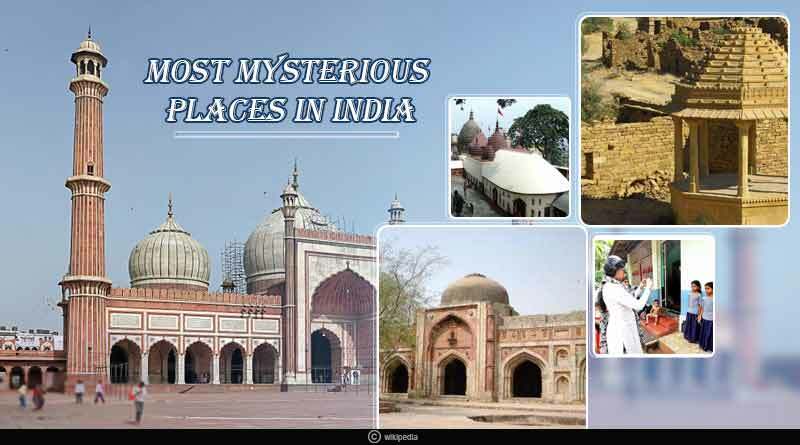 For more articles like ‘Most mysterious places in India’, do follow us on Facebook, Twitter, and Instagram.